During a dental cleaning (sometimes called a prophylaxis), a full mouth radiography is performed to ensure your pet’s root and bone health are normal. Plaque and tartar are removed from a pet’s teeth, and the health of the entire mouth (tongue, gums, lips, and teeth) is assessed. A thorough dental cleaning can be accomplished only while the pet is under general anesthesia. 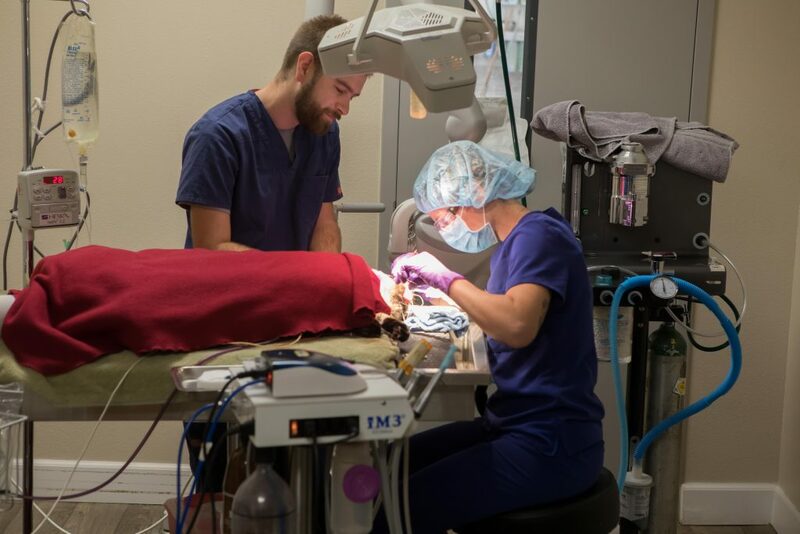 Anesthesia keeps your pet free of pain during the dental procedure and allows your veterinarian to fully inspect the teeth and remove tartar from under the gums. During anesthesia, a soft plastic tube is inserted into the trachea (the main airway in the throat) to support the patient’s breathing. Placement of the tracheal tube also prevents inhalation of bacteria that are aerosolized during the dental cleaning. Eighty-five percent of all pets have periodontal disease by the time they are 3 years of age. Dental disease can result in bad breathe, painful chewing, and tooth loss. Bacteria under the gum can travel to the heart, kidneys, and liver causing the acceleration of many disease states.